Burning Moon's Inside advice: Xehar Curvy Review! I am always on the look out for cute new pieces to add to my wardrobe that are both comfortable and stylish so when I was offered a chance to work with Xehar Curvy on a review of their clothing I jumped at the chance. They have a lot of cute clothing on their website so it was hard to settle on just one thing, but I ended up going with the Anne Floral Sheath Dress. 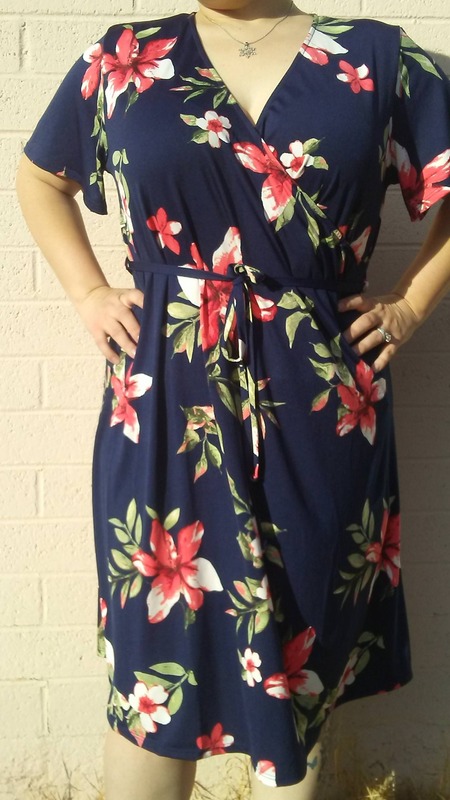 The Anne Floral Sheath Dress features a tropical floral print on a navy cloth, the fabric they used is actually quite comfortable and soft to the touch I was pleased with how well the material breathed and how light weight it was. However I didn't quite like the fit, the shape of the dress ended up being larger than expected so it was a bit too large and felt more like I was in a puffy suit than in a pretty dress. I was hoping the fit was better as I have a large chest and this dress does offer plenty of room to hold everything in, but seeing as how I wasn't quite happy with it I gave it to someone I know would love it and they did (plus it fit nicely) so it was a win-win for us both. This dress is 95% Polyester 5% Spandex and can be purchased on their website for $29.99, the shipping was speedy and the dress arrived without any issues. Parragon Books Jan Book Box! Shamrock Farms Cold Brew Review! The AZ Renaissance Festival is here!